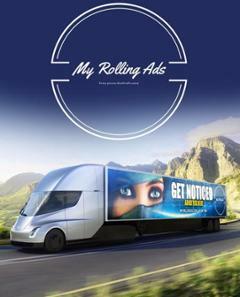 My Rolling Ads was created to engage and communicate with a hyper-connected, on-the-go world. Consumers want to connect with your brand on their terms, and it's My Rolling Ads' mission to give them every reason to choose your brand. Our platform is remarkably effective because we create value, and brand engagement by amplifying mobile advertising with call-to-action solutions. Impressive and lasting connections are made through convenient and efficient mobile to mobile interface. My Rolling Ads is a viable medium that facilitates and extends the reach and frequency in integrated campaigns and is the most efficient driver of mobile, social, and digital engagement. In addition, our mobile billboard can make a powerful addition to any media mix, and complement other street level media. Consumers will not only view your message, but become brand ambassadors, constantly sharing, liking, tweeting, creating hashtags, driving consumer traffic to your media, and ultimately resulting in increased sales and purchase of your product. My Rolling Ads is not limited by location, it is a national broadcast medium that constantly advocates for your brand as it reaches consumers on -the-go who are susceptible to brand messaging. Why are transit mobile billboards the most affective medium to drive your point across? We created My Rolling Ads to diversify and accelerate companies advertising success. What do we do better than other national broadcast? Transit mobile billboards (out-of-home advertising) most efficient driver of digital engagement. Participants reported the following actions on their smartphone in response to OOH ads (in the past month). We are a national broadcasting medium that helps garner attention in a overcrowded media jungle. Our transit mobile billboards are essential to any and every media mix because it can't be skipped, ignored or blocked. Contact a sales representative to learn more.